The Nakajima Ki-84 Hayate (Gale) was numerically the most important fighter serving with the Japanese Army Air Force (JAAF) during the last year of the Pacific War, and was probably the best Japanese fighter aircraft to see large-scale operation during this period of the war. 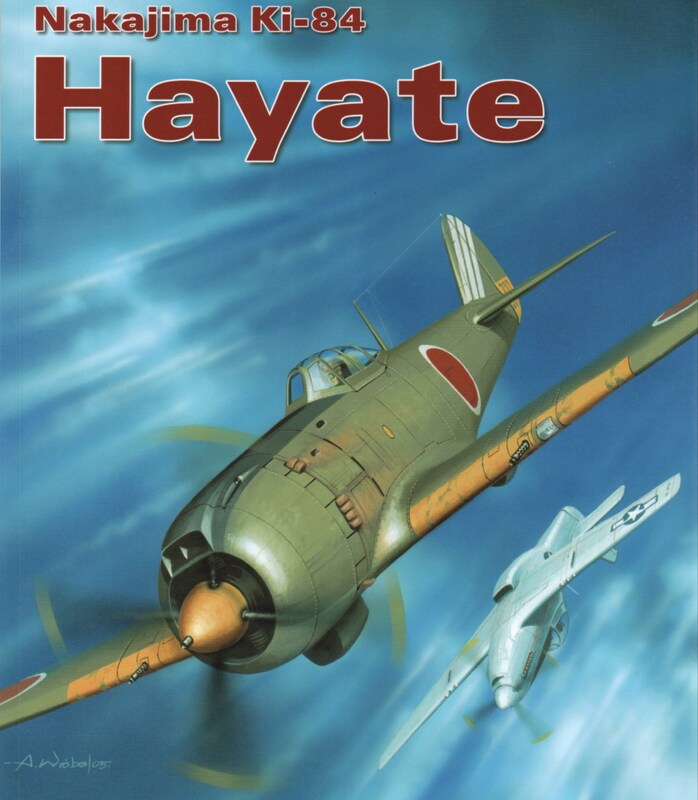 The Hayate was fully the equal of even the most advanced Allied fighters which opposed it, and was often their superior in many important respects. It was well armed and armoured, was fast, and was very manoeuvrable. Although it was generally outnumbered by Allied fighters which opposed it, it nevertheless gave a good account of itself in battles over the Philippines, over Okinawa, and over the Japanese home islands. So desperate was the need for Ki-84s in the last months of the war, Japan was building underground factories with a planned rate of 200 aircraft per month. The history of the Ki-84 can be traced back to just after the beginning of the Pacific War between Japan and the United States. Just three weeks after Pearl Harbour, the Koku Hombu instructed the Nakajima Hikoki K.K. (Nakajima Aeroplane Co Ltd) to begin the design of a replacement for the Ki-43 Hayabusa, which itself had just entered service with the JAAF. The JAAF wanted a general-purpose long-range fighter that would be superior to those that were then under development in the USA and Britain. The specification called for an aircraft with the manoeuvrability of the Ki-43 Hayabusa coupled with the speed and climb of the Ki-44 Shoki. In addition, the aircraft was to be provided with armour protection for the pilot and was to be fitted with self-sealing fuel tanks. The aircraft was to have a maximum speed of 398-423 mph, and was to be capable of operating at combat rating for 1.5 hours at distances as far as 250 miles from its base. The wing loading was not to exceed 35 pounds per square foot. The manoeuvrability requirements were relaxed somewhat as compared to those of the Ki-43, but were to exceed those of the Ki-44 which had been designed strictly as a bomber destroyer. The engine was to be the Nakajima Ha-45 eighteen-cylinder double-row air-cooled radial. The armament was to be two 12.7 mm Type 1 (Ho-103) machine guns and two 20-mm Ho-5 cannon. Koyama was named as the project engineer, and work on the Ki-84 began in early 1942 at Nakajima’s Ota plant in Gumma Prefecture. The first prototype was ready in March of 1943. The aircraft was a fairly conventional low-wing monoplane that bore an obvious family resemblance to the Ki-43 and Ki-44 fighters that preceded it. The 1800-hp Nakajima Ha-45 engine that powered the Ki-84 was a JAAF version of the Navy’s NK9A Homare. Experimental models of the Homare engine had been test run as early as May of 1942, but the development of the Homare was long and difficult, and few Homares were available until August of 1943, and experimental production did not begin until late 1943 at Najajima’s Musashi engine factory. A big exhaust collector pipe was mounted on each side of the engine behind the cowling gills. The all-metal airframe followed the common Japanese practice of building the wing integral with the central fuselage in order to save the weight of heavy attachment points. The fuselage was of oval section, with flush-riveted stressed skin. The two-spar wing carried metal-framed, fabric-covered ailerons and was provided with hydraulically-operated Fowler flaps. A total of 220 US gallons of fuel was carried in tanks aft of the cockpit and in the wings. The engine mounting and cowling incorporated the oil cooler and intakes for the carburettor and supercharger. The three-part canopy had an aft-sliding central section. All three undercarriage members were hydraulically retractable. The main gear retracted inward and horizontally into the wings and was fully covered with flush-fitting doors. The non-steerable tailwheel retracted into the fuselage and was covered by a flush-fitting door. The rudder was of metal construction but was covered with fabric. The tailplane was set well ahead of the vertical surfaces. Two 12.7 mm Ho-103 machine guns with 250 rpg were mounted in the upper cowling, and a 20-mm Ho-5 cannon with 150 rounds was mounted in each wing outboard of the main undercarriage leg. The pilot was protected by a 70-mm armoured windshield and by 13-mm armour plate in the rear and floor of the cockpit. Provision was made under the fuselage centreline for a single drop tank. The Ki-84 prototype flew for the first time from Ojima Airfield in April of 1943. The second prototype flew in June. The first prototypes were assigned to the JAAF for trials at the Tachikawa Air Arsenal under the direction of combat-experienced pilots, and the modifications recommended were incorporated into the fourth prototype. The fourth prototype had a maximum speed of 394 mph at 21,800 feet, and could achieve a speed of 496 mph in a dive. The test program went well, and a service trials batch of 83 machines were ordered in August of 1943. These were built between August of 1943 and March of 1944. The pre-production machines differed from each other in minor details, but fuselage changes were incorporated to ease production, and the area of the fin and rudder was increased to improve control on takeoff. A few service trials machines were handed over to the Tachikawa Army Air Arsenal. JAAF pilots commented favourably on the machine, although its maximum speed was below the requirement. The aircraft had a maximum speed was 388 mph, could climb to 16,405 feet in 6 minutes 26 seconds, and had a service ceiling of 40,680. This made the Ki-84 the best-performing Japanese fighter aircraft then available for immediate production. A few service-test Ki-84s were fitted experimentally with a ski undercarriage. The legs retracted into the normal wheel wells, with the skis lying flat underneath the wing roots. These aircraft were tested in Hokkaido during the winter of 1943-44. The ski installation increased the maximum weight, and thus had an adverse effect on maneuverability and reduced the maximum speed by 8 mph. Consequently, skis were not incorporated on production machines. The Ha-45 engine entered full-scale production in April of 1944 as the Type 4. Production of the Type 4 engine was hampered by many setbacks, most of which were due to inadequate preparation, with shortages of jigs, tools, and skilled personnel being significant problems. Service tests of the Ki-84 began in Japan under operational conditions in October 1943. The type was accepted for production as the Army Type 4 Fighter Model 1A Hayate (Gale) or Ki-84-Ia. A second pre-production batch of 42 Ki-84s was started in April of 1944. These were built between March and June of 1944. These were built in parallel with the first production aircraft, which began to roll off the production lines in April of 1944. Both types were fitted with individual exhaust stacks, which provided some thrust augmentation, and could increase the maximum speed by some 9-10 mph. Each of the two wing racks could carry a 44 Imp gall drop tank or a 551-pound bomb. Some of the aircraft of the second service test batch were tested with wings of increased span and area to serve as development aircraft for the projected Ki-84N and Ki-84P projects. Early production machines had the 11 and 12 models of the Ha-45 engine, with takeoff ratings of 1800 hp and 1825 hp respectively. Later models had the model 21 version of this engine, delivering 1990 hp for takeoff. These engines were rather unreliable and were subject to numerous quirks. Sudden loss of fuel pressure was a constant source of difficulty, and this was addressed by the adoption of the Army Type 4 radial Model 23 ([Ha-45]23) for even later production machines. This Model 23 engine was a modification of the Model 21 engine fitted with a low-pressure fuel injection system. The Ki-84-Ia was followed on the production line by the Ki-84-Ib Army Type 4 Fighter Model Ib. In the Ki-84-Ib, the fuselage-mounted machine guns were replaced by a pair of 20-mm Ho-5 cannon, giving the aircraft a total armament of four 20-mm cannon. The Ki-84-Ic was a specialized bomber destroyer variant armed with two 20-mm Ho-5 cannon in the fuselage and two wing-mounted 30-mm Ho-105 cannon. Only a small number of this version were built. In March of 1944, the experimental squadron that was conducting the service test trials of the Ki-84 was disbanded, and its personnel transferred to the 22nd Sentai. This unit was re-equipped with production Hayates and transferred to China where it entered combat against the USAAF’s Fourteenth Air Force in August of 1944. The Ki-84-Ia quickly established itself as a formidable foe that compared favourably with the best Allied fighters then available. 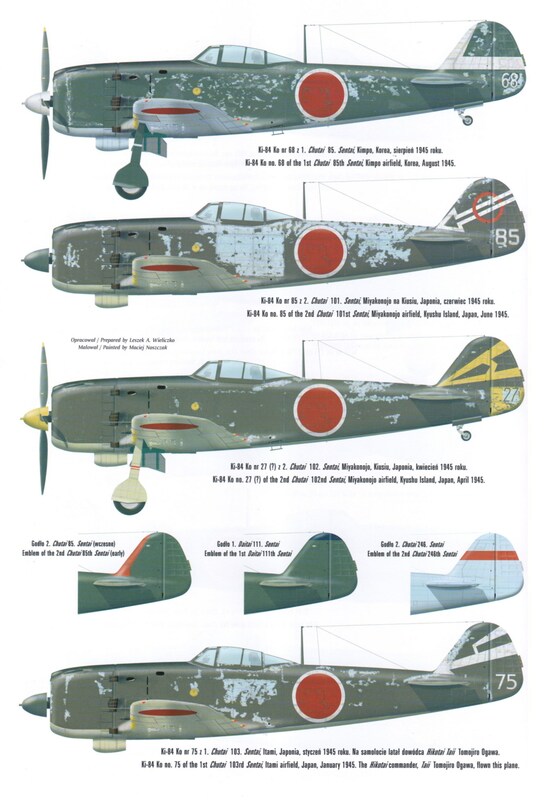 The Hayate had an excellent performance and climb rate, and had none of the shortcomings of the earlier generation of Japanese fighters, being well armed and possessing adequate armour protection for the pilot. In addition to the penetration and interception roles, the aircraft was used as a fighter-bomber and dive bomber. The 22nd Sentai was later moved to the Philippines, where it was joined by the 1st, 11th, 21st, 51st, 52nd, 55th, 200th, and 246th Sentais. Following encounters with the Ki-84-Ia, the Allied Technical Air Intelligence Unit (ATAIU), commanded by Colonel Frank McCoy, assigned the code name FRANK to this fighter. This code name had previously been assigned to a fictitious aircraft known as the “Mitsubishi T.K.4”, which was erroneously believed to be under development in Japan. When the T.K.4 failed to materialize, Colonel McCoy decided to name the new Ki-84-Ia after himself. The FRANK later appeared in the battle for Okinawa, serving with the 101st, 102nd, and 103rd Hiko Sentais. Two new Sentais, the 111th and the 200th were activated with Hayates. The Hayates were used for long-range penetration missions, fighter sweeps, strafing, interception and dive-bombing missions with considerable success. The Ki-84 proved faster than the P-51D Mustang and the P-47D Thunderbolt at all but the highest altitudes. At medium altitudes, the FRANK was so fast that it was essentially immune from interception. The climb rate was exceptionally good, 16,400 feet being attained in 5 minutes 54 seconds, which was superior to that of any opposing Allied fighters. The Ki-84 had a close resemblance to the Ki-43 Hayabusa, which caused many Allied fighter pilots to confuse it with the earlier Nakajima fighter during the stress of combat. Many an American pilot, having sighted a Japanese fighter he believed to be a Ki-43 and salivating at the prospect of a quick and easy kill, suddenly found he had latched onto a different bird entirely. The Ki-84 even did well at the fighter-bomber role. On April 15, 1945, a flight of eleven Hayates from the 100th Sentai made a surprise air attack on American airfields on Okinawa, damaging or destroying a substantial number of aircraft on the ground. However, eight of the Hayates were destroyed in the attack, and one made a forced landing on a small islet near Kyushu. 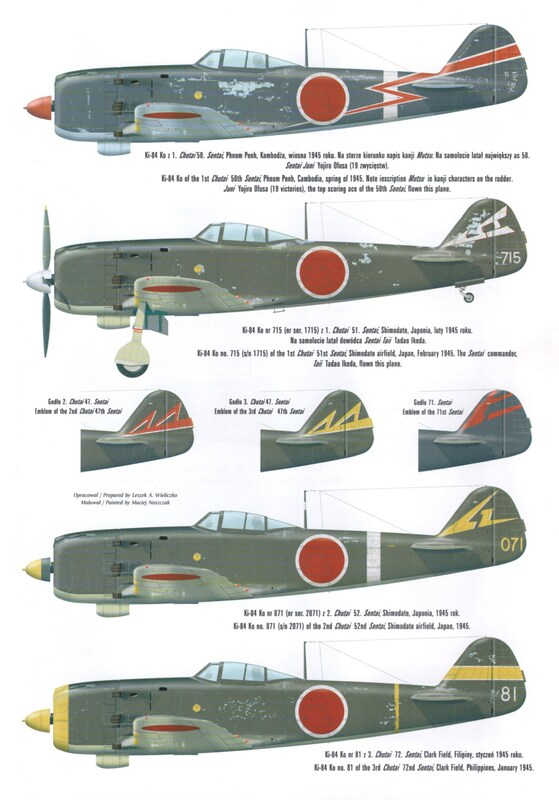 Although the Ki-84 was intended for the offensive, penetration role, Hayates were assigned to the defensive role over the Japanese home islands during the last few weeks of the war, operating with the 10th Division responsible for the defence of Tokyo. The units assigned to home defence included the 47th, the 73rd, the 111th, and the 112th and the 246th Sentais. Since the Hayate was regarded as being essential for the interception role, relatively few were expended in Kamikaze attacks. The Hayate was simple to fly, and pilots with only minimal training could fly the type with relatively little difficulty. However, the aircraft did have have certain poor control characteristics to which a veteran pilot could easily become become accustomed but which could be deadly in the hands of an inexperienced pilot. Taxiing and ground handling were generally rather poor. On takeoff, once the tail came up, continual pressure had to be maintained on the starboard rudder pedal to counteract a tendency to swing to port caused by the high engine torque. In flight, the controls were sluggish in comparison with those of the Hayabusa, and the elevators tended to be heavy at all speeds. The ailerons were excellent up to about 300 mph, after which they became rather heavy. The rudder was mushy at low speeds for angles near neutral. However, most of the defects with the Ki-84 can be laid to poor quality control during manufacture, especially during the last few months of the Pacific war. 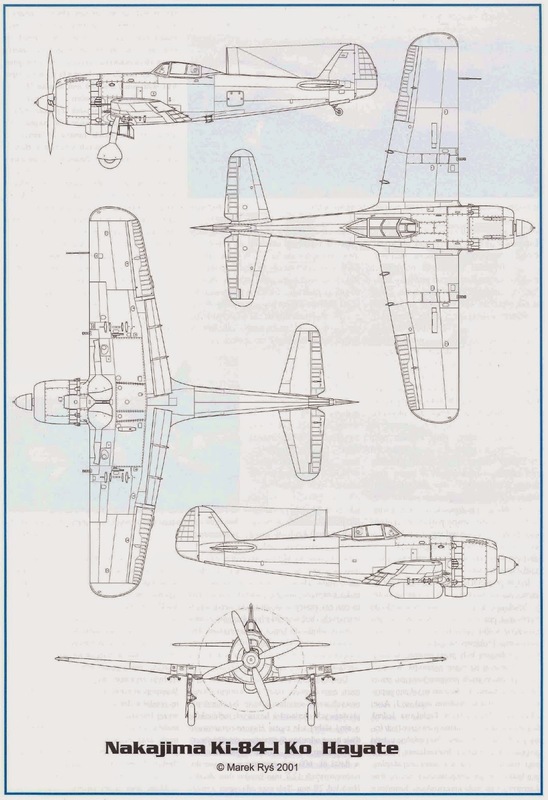 When the Ki-84 was being designed, emphasis had been placed on ease of production, and the manufacture of the Ki-84 required less than half the tooling needed by the Ki-43 and Ki-44 which preceded it. However, many experienced workers had been drafted into the military, and this loss, acting in concert with the accelerated rates of production ordered by the Japanese Ministry of Munitions, resulted in a steady drop in quality standards of both the engine and the airframe of the Hayate as the war progressed. The performance and reliability of production Hayates was seldom as good as that of the service test machines. As the quality of the workmanship steadily deteriorated, the performance of the Hayate steadily declined as production progressed, with later machines having successively poor and poorer performance and mechanical reliability. The hydraulic and fuel pressure systems were both poorly designed and were subject to frequent failures. The wheel brakes were notoriously unreliable, and the metal of the landing gear struts was often inadequately hardened during manufacture, which made them likely to snap at any time. This caused many Hayates to be written off in landing accidents, without ever having been damaged in combat. 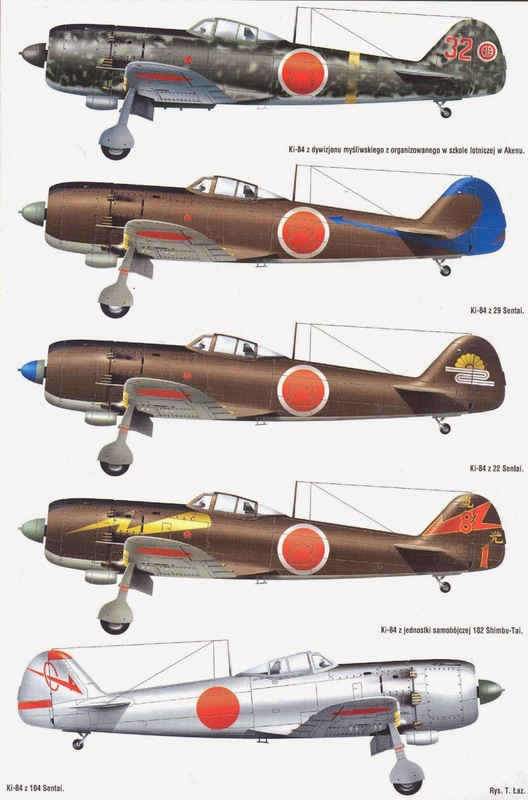 In Richard M. Bueschel’s series on Japanese WWII fighters (i.e, “Nakajima Ki-84 Hayate in Japanese Army Air Force Service) and Rene Francillon’s “Japanese Aircraft of the Pacific War”), the authors repeatedly mention that the latter-day Japanese fighters, while technically equal to their Allied counterparts, were plagued by variable and poor workmanship; Bueschel writes that the Ki-84 could only rarely achieve a level speed of 400 km per hour. For example, the level speed of the Nakajima Ki-84 fighter was rated at 620 km per hour, yet reportedly most late-production specimens could not achieve even 400 km per hour due to poor workmanship of the airframe and engine. I recall reading accounts of trials of captured Japanese aircraft, in particular the Ki-84, which stated that the fitting of US spark plugs made a vast difference to the aircraft’s performance. The fitting of US brake pads too, where possible was found to be a must too! Material shortages and quality problems in seemingly minor areas can have a dramatic effect on overall performance. Engine shortages and delays were a constant problem for the Hayate. Although the Ha-45 engine had been plagued with production difficulties all throughout its life, most of the delays in deliveries were caused by frequent visits of 20th Air Force B-29s to the Musashi engine plant during the last year of the war. This plant was hit by B-29 raids on no less than twelve occasions between November 24, 1944 and August 8, 1945. Production was able to continue at the Musashi plant until April 20, 1945, when it was finally put out of business for good and all production came to a standstill. Operations were transferred to an underground plant at Asakawa. and to a new plant at Hamamatsu, and a trickle of engines still continued to flow, but the supply of engines never reached the previous peak. Because of the production delays and components shortages, the quality of the Ha-45 engines delivered steadily deteriorated as the months passed, and later engines were considerably less powerful and less reliable than those initially delivered. By June of 1945, the lowering of manufacturing standards had cut the climb rate of the fighter so severely that the aircraft was virtually useless at altitudes over 30,000 feet. A total of 1670 Hayates were built during 1944, making the aircraft numerically the most important Japanese fighter in production at that time. However, this was still far below JAAF requirements. Orders for 1944 alone totalled 2525 machines, almost a thousand more than were actually delivered. This shortfall was partly a result of the failure of subcontractors to deliver components on schedule, but became increasingly caused by Allied air attacks on Japanese industry as 1944 neared its end. On February 19. 1945, Nakajima’s Ota plant was attacked by 84 B-29s, which seriously damaged the plant and destroyed some 74 Hayates on the assembly line. Further attacks on the plant by US carrier-based aircraft further damaged the plant to such an extent that an extensive dispersal program had to be carried out, with an accompanied sharp drop in production. In May of 1944, Nakajima opened up a second Hayate manufacturing line at its Utsonomiya plant. This facility had built 727 fighters by July of 1945, less than half the number scheduled during this period. Construction of the Hayate was also assigned to the Mansyu Hikoki Seizo K.K. (Manchurian Aircraft Manufacturing Company), which started production in the spring of 1945 at its Harbin plant in Manchuria. However, only a hundred or so Hayates were built at Harbin before the end of the war brought production to an abrupt end. Total production of the Hayate by all factories was 3514, including prototypes and service trials aircraft. In 1946, a captured late-production Hayate was restored and tested at the Middletown Air Depot in Pennsylvania. At a weight of 7490 pounds, the aircraft achieved a maximum speed of 427 mph at 20,000 feet, using war emergency power. This speed exceeded that of the P-51D Mustand and the P-47D at that altitude by 2 mph and 22 mph respectively. 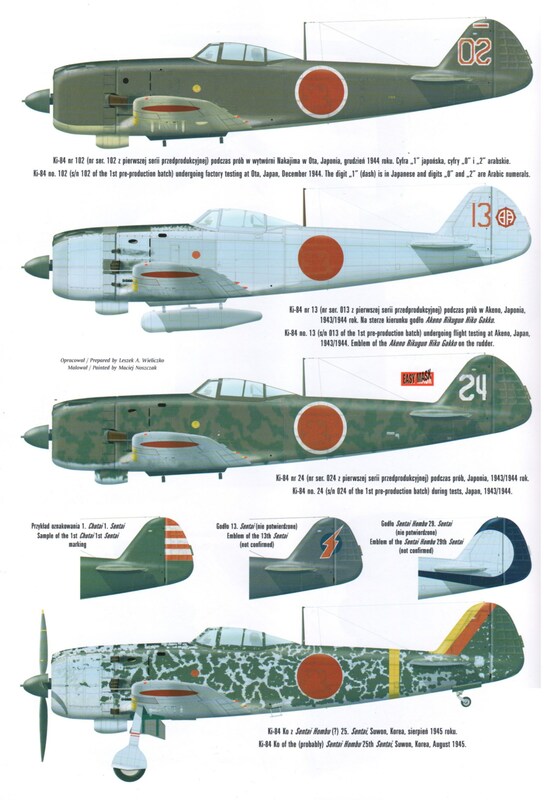 These figures were achieved with a superbly maintained and restored aircraft and with highly-refined aviation gasoline, and were not typical of Japanese-operated aircraft during the later stages of the war.